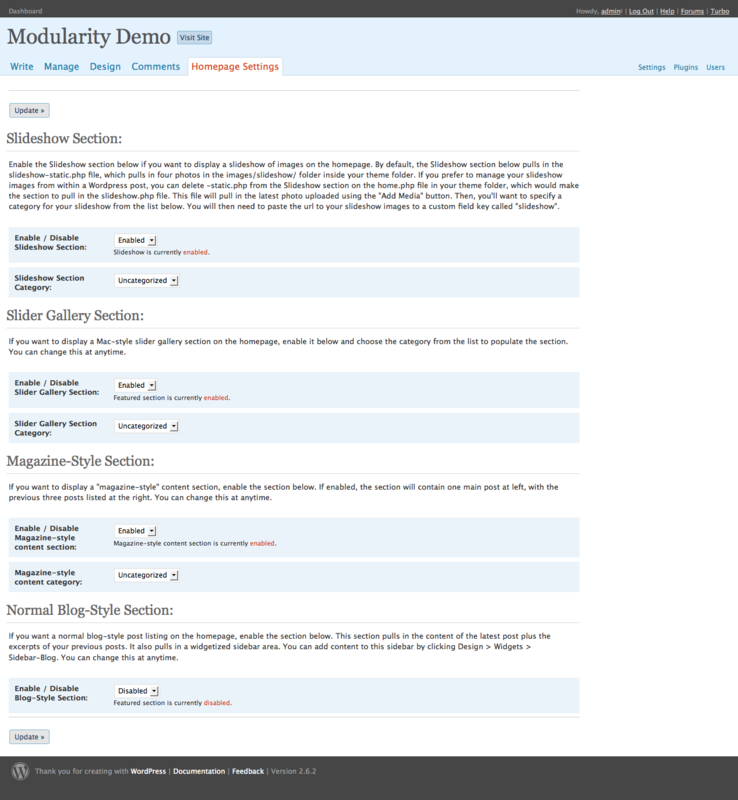 Modularity is a highly customizable multimedia theme framework for WordPress. The theme design was developed with users who appreciate visual browsing and prefer a minimal layout, with their photos and multimedia featured front and center. Virtually every aspect of the theme design can be controlled from either the Theme Options page or the Homepage Settings page. Theme Options page, where you can define background, text, link colors, contact info, site tracking code and more. Click-down navigation for a compact, minimalist masthead. The theme includes “apps” which you can enable or disable from the Homepage Settings page. 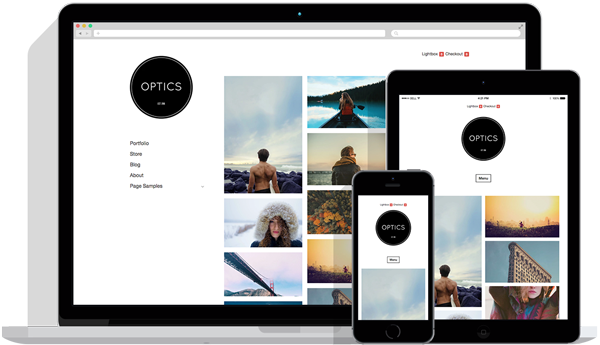 These apps can transform the theme into a portfolio site for photographers and multimedia producers, a magazine-style site, or a normal blog-style homepage literally at the click of a button. In the future, we will be releasing “child themes” for Modularity to provide design alternatives and additional applications that will make Modularity even more configurable. You’ll definitely want to subscribe to GraphPaperPress.com to keep up on all the latest developments and enhancements for Modularity. This entry was posted in Themes and tagged multimedia. Bookmark the permalink. Could you please tell me whether one of the options for the homepage is to have a weblog-style presentation across the full 950px width of the theme? Essentially what I’m asking is whether it’s easy to have the homepage look the same as the category pages do. Glad you like it Matt! on the blog.php file. If others think a sidebar-less front page blog layout is desirable, I might make it an option on the homepage settings page. @ Matt – Actually, I decided to go ahead and build that feature into the Theme Options panel. So, now you can either enable a sidebar, or disable it to make the theme 950px wide….all without editing a single line of code. Everything is built into the theme options page. As a subscriber, when do we get access to this? @ Lee – Before Wednesday, Oct. 8. Just tweaking a couple of core things today and tomorrow. Thanks Thad. I thought the first response was comprehensive but then to build it into the theme – even better! I have an upcoming project I’m working on and it looks to me like Modularity is going to be right on the money with what I’m looking for. Thad, from memory I’m sure when I looked at the demo yesterday individual posts covered the full width of the white main content area (950 pixels). Now there seem to be two columns, with a navigation bar on the right, and the main content is much narrower. Am I imagining things, or is this just one of the options built in to the theme? Can the individual slideshow images be linked to an individual blog post page? I just purchased the “Get All Themes” package but it is missing the “Modularity” theme. @ Matt – you can enable or disable sidebars, slideshow, slider gallery, Magazine front, blog-style posts on the Theme Options and Homepage Settings pages. Everything is completely modular, including sidebars. It can be both a two column theme or a one column theme. @Brendon – Yes. I provide instructions on the Homepage Settings page. The instructions are also commented out in the HTML source code. @Jlabelle – I am sending out the link to subscribers later today. I’m going to subscribe as soon as Modularity is available for subscribers – is it up yet? Hey Paul – Modularity will be available for subscribers later tonight Tuesday, Oct. 7. If you haven’t done so already, you will definitely want to become a Graph Paper Press subscriber so you can get access to all the themes in 2008. Thanks Thad, brilliant – will sign up as subscriber tonight so I can work on it tomorrow – fantastic theme. Hey man, I just purchased your template for 75. however the email confirmation was not set up under my name in paypal. so can i have it sent to my new email. ([email protected]) Who do i call to fix this matter. I just sent you the download. Please confirm receipt. Thanks, Thad. You read my mind and developed a hybrid of everything I like about your previous themes. I’ll purchase the Developer’s license as well. Really nice work, I recommend it to anyone considering the investment. How do I resize the theme from 950px to 800px? Thank you. This column spans 14 columns, each measuring 40 pixels wide, with a column border. This is the last container, which could be your sidebar. When you want to end the floating containers, add the "last" class, which I did above. You will need to replicate the method posted above on all template pages to make the 800 px wide theme. @Ovi – Modularity makes it very easy to change colors and add homepage apps, which can totally change the configuration and layout of your homepage. My student recently purchased your Modularity theme for $75. Her name is Michelle King ([email protected]). We have yet to receive the theme, so, please, send the email to either Michelle at the above email for her or to me at [email protected]. I’m using Modularity and I love it; however, I’m having an issue posting video to my blog. Is there a widget or special plugin I need to install? @ Mrs. Evans – The download link is sent out automatically (by computer scripts) after payment is received. Because you haven’t received it yet, I have thus sent both you and Michelle the download link manually, twice, since last night. Please confirm receipt. If you still aren’t receiving the download link, call me and I’ll make sure you get it. @Shavonne – The instructions for adding video to your site can be found in the INSTALL.html file in the download. @Ovi – There is no cpanel for the video uploading. You simply use custom fields, as per the instructions in the INSTALL.html file in the download. The best way to compare the themes is to visit the theme demo pages for each theme. Briefly, Modularity makes it easy to change the homepage layout, because of all the theme options that come packaged with the theme. 1. Can I change the words “Catagories” and “Pages” in the upper-right navigation menus? 2. Can I get rid of the white fade in the slideshow so i can use that area as a still banner? 3. Can I change the words “Latest” and “Previously” in the magazine style layout? Hi great theme, i bought it. Bad, it´s not working with the NextGenGallery. This is a easy administrations tool for images. I administrate all my images with them. What can i do…?!! Excellent theme Thad.. Keep up the good work. I’ll be giving the Modularity theme a test run this week, if all goes well I’ll definately buy the whole package. Hi – I have paid for your ‘modularity’ theme and have downloaded the zip file – I am unable to extract to my computer because for some reason you have duplicated file names and folders in the zip file and windows wont allow in the same folder. Please advise on how to fix? The theme does not show up as an option when attempting to select themes – is there a conflict with wordpress 2.7? Is there a revision to modularity that I can download? Please help! I’ve been looking for a photoblog theme for one year and modularity turns out to be exactly what I need! Thanks and keep up the great job! i purchased modularity with paypal today – but never received confirmation or download…. my credit card was billed. Have just been playing around with Modularity Lite, and I have to say that it is one of the most impressive themes I have seen. I’m this close to parting with some hard earned moolaa and splashing out on the full version of Modularity – I have but two questions. 1) Will my purchase grant me access to any future versions? ie: if wordpress itself has a major update – will Modularity be updated and will I be provided a link to an upgrade? or will I have to pay again? 2) I want to buy the single site license, but I will most likely be building the site I want to use this theme for on my personal web space – than transfering the site to the final domain once it is ready to go live. Will this still fall in line with the license agreement? @AFD – yes, you will receive future updates to Modularity when WordPress releases updates depending on which subscription you choose. You will receive the new theme release via email download. The license also allows you to use the theme on a single site, so you can transfer the theme to your new domain whenever you like. As a follow up …. is it possible to purchase the individual license initially and then upgrade to a full Developer’s License at a later date and at what price? I know this was possible in the past (as per a post in the forum this past summer)… just making sure your terms have not changed. Sorry if this is not the place to post this question, however, I sent a “contact” email yesterday and thought it may have been grabbed by a spam filter. Please let me know regarding this as I am looking forward to implementing Modularity with the Modfolio child theme. Does anyone know how to update from Modularity 1.3 to 1.4, it’s prompting me to buy it again for the second time. just shoot me an email with your name and email and I’ll send you the latest. I need to make the slide show just a static image , like a header….how do I do that? Awesome Thank you so much, Also Its not letting me add categories, once I type in the category the save category function doesn’t seem to save it! Love the Theme though! Is it possible to insert a single flash movie in replace of the slideshow? I just recently purchased the single site but decided that i want to upgrade to the multi-user license… can you give me the balance for that? Great themes… i am quite impressed. I bought this theme yesterday and i havent gotten the download yet. The download link is sent to the email address that you use for Paypal. Please check that email account. I’ve emailed you the download link to your other email regardless. Anybody have a working slider? Trying to figure out what I’m doing wrong. How do I know if I downloaded the latest version of Modularity. I have the latest version of WP 2.7 and just downloaded Modularity so is this the latest? If you downloaded modularity after Jan. 14, then you have the latest version. You can check your theme version number by opening style.css. I paid for Modularity on January 28th. I’m trying to log back in to read through the forum to get answers to questions. I know you’ve made changes to your business model since then (subscription vs. straight download). Do I need to re-register or can you send me new log-in credentials? If you purchased Modularity before we implemented our new system, just email us info at graphpaperpress dot com and we will add you to the system. Be sure to forward us your receipt for Modularity. I’m really intersted in buying modularity but wanted to know before I do- can you change the background from black to an image. Also can you replace the header text with an image (logo)Are there instructions to do this within the tutorial section. I was also would like to use a logo instead of the header text… is this possible? Amy, I know you can change the background colour in theme options. I´m havin a question bout editing the theme. How can i remove the “LEAVE A COMMENT” tag at the end of each post? I cant find anything in google about that. i disabled comments but still i´ve got the stupid “leave a comment” tag. Will this plugin work on wordpress 2.7.1? Our IT was commenting on this the other day so I had to have a look. Beyound me, but I am sure we will be using this in the near future. How can i insert google addsense in my modularity blog. I don’t see this theme in the members area. Is this a paid theme or a free theme? hmm, I have tried HD, but many users have reported problems, probably because their connection speed is not fast enough..
Also, on heavy loads, that just kills my server’s ressources..
seems I will just stay in the “regular quality images” format for now.. I think your theme club is really cool! I really like this theme. Nice site.. Keep up the good work. hi i got a css trouble in iexplorer with nav menu, its look bad. I don’t want all themes – I just want one. 49 bucks a quarter?! no way. great product guys, but I ain’t buying for that. shame. I also liked the theme. You have tried paid services? Nice themes! I become a new member. Just wanna ask you, could i change and am i permit to change the pictures as i like? I want to say thanks for giving a freebies of themes. Thanks for sharing that. As you said there pay and freebies, how many themes you are providing for paid members. Would it be a problem with theme if there is nothing support and tutorial for freebies? What an awesome theme. I’ve been looking around for theme for my site but I think this is suitable. It’s compatible with WordPress 2.8? Fantastic information,This is the first time i heard about this. keep it up this good works. any chance of a free one? Hi Dude, thank you so goddamn much for that post. That helped out a lot. Thanks again!! I am very happy to appreciate you for your informative blog. Your themes are really wonderful. I would like to use this, but I would like to change the background into white color, can you please help me. Excellent post, and by the way, nice blog. I’m definitely going to bookmark this site! I look forward to contributing. Thanks for sharing. great efforts dude, need to bookmark it..
full seo? title and alt? how about their h1 h2 h3 etc? Nice one..Love this theme.Already using it for my niche blog!Thanks! theme with multimedia features is a good option for the site i ll try this theme. Thanks to provide such a valuable information. may i add a link to my slideshow in the front page? the features of this theme is simply great and nice. this theme contain so many features. all the best for your next post..
hopefully someone could help me out. How would I rename the default links on the blog (pasted below). I tried to look in the header.php but no luck in finding were to edit them. Someday, I want to make my theme myself. How do you add a background image to this theme, no matter what I try, a blank screen just keeps coming up. Some of the apps on this look really cool definatley got to give them a try. Will you be releasing any other in the near future? This theme is really good and has got some really good features to match, thanks . I’m just starting WP website after making quite a few with Joomla. It’s features like this that are making me learn to WP for the new site ! thanx for this informations ! I am getting into WP..this theme is great! I particularly like the image slider gallery part in this theme, works a treat. Thanks a lot. I really love the theme, and also i wish you a happy new year. Will i be able to change colors? I mean i want it to be blue instead of black and hyperlinks to be black. Really Cool theme. It looks like a magazine. I will be install this theme for my blog which is provide celebrity information. I would like to change the sidebar titles into a different language / tittle. I have manage to change the main menu into the NAV.php but I do not know how to change it into the Nav-interior. I cant find the download link to Modularity anywhere in the site except for modularity lite.zip. Can anyone please help me out? I am already a member of this site. Is the Modularity theme being worked on? I downloaded the F8 theme but can’t seem to find the Modularity theme. thanks admin, cool theme , downloading. …. But where can i, or how can i add adsense in it? Downloaded going to set up today.Thanks. Built in full-screen HD video player is one of the greatest features of this theme. At last my search for a perfect theme is over now. I am doing volunteer work to help out a Charter High School with their blog for their school Radio Station. I was wondering if you have a blog theme with a comment section on the landing page similar to this comment section? This is a big wish for this high school. Any info on this would really be appreciated. The article is immensely informative and fruitful. It will help readers to take proactive decisions and update themselves accordingly. Thanks a lot for providing so valuable facts. thanks…very good theme…well done my friend. Very well designed..This is what I’m looking for..I will check on the features for this. This was really an impressive theme. I have been using themes for WP for a quite a while now but this one seems to be the best.Thanks for posting! thank’s for sharing file and i will download your file to my computer. a way to use the ‘old’ good working version? links to the ‘old’ website http://www.exima.nl. When anyone knows the problem i can make the problems visible for them. Nice One, It was certainly interesting to read it. I hope to read more on that blog soon.